I took the below photo of Malabar Whistling Thrush about 3 years back. The photo could have been better, I know. Sorry for the disappointment. But I believe that this post however will mesmerize you with the fact of the bird. Some of you might be aware already, but for others, there is a strange thing about this bird. As the name suggests, the bird whistles. But did you know that Malabar Whistling Thrush can whistle exactly like men? In fact, Malabar Whistling Thrush can whistle way better than any man. I whistle quite a lot and had believed that I whistle very well. But when I heard the Malabar Whistling Thrush, I was stunned. I kind of got an inferiority complex, in a good way. 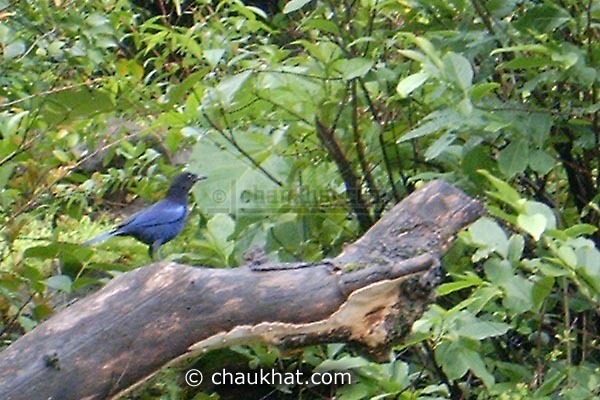 Malabar Whistling Thrush is found in dark forests, mostly on shores of shallow river flows. The most number of Malabar Whistling Thrush is in the Western Ghats. However it is sparsely found in the mountain range of Satpuda also. Malabar Whistling Thrush sings very melodiously with the length of their songs at the longest during dawn. The songs of Malabar Whistling Thrush can be heard for approximately up to 1 kilometer in the silence of the forests. Malabar Whistling Thrush is not a migratory bird, but is known to travel great distances for reasons unknown. The scientific name or binomial name of Malabar Whistling Thrush is Myophonus Horsfieldii. I've never heard of this before. Interesting. I would love to hear it! I saw a Whistling Thrush at Gavi eco tourism, Kerala near Pamba-Sabarigiri.The bird was very bold, came inside the restaurent to eat the left overs. We took photographs of it and recorded its song.Fantastic, melodious wild whistler. @ G.Visakh Varma: Nice to know your experience with Whistling Thrush. Gavi eco resort in the Peryar tiger reserve in the north-east region of Pathanamthitta district in Kerala State is a very quite place for wild life photography.One could see the famous Sabarimala Temple from the lofty mountain ranges.The place is a bird paradise.